For filmmaker Rob Stewart, exploring sharks began as an underwater adventure. What it turned into was a beautiful and dangerous life journey into the balance of life on earth. Driven by passion fed from a life-long fascination with sharks, Stewart debunks historical stereotypes and media depictions of sharks as bloodthirsty, man-eating monsters and reveals the reality of sharks as pillars in the evolution of the seas. 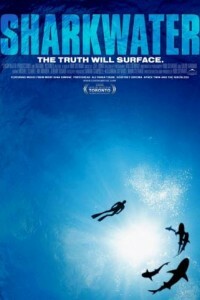 Filmed in visually stunning, high definition video, Sharkwater takes you into the most shark rich waters of the world, exposing the exploitation and corruption surrounding the world’s shark populations in the marine reserves of Cocos Island, Costa Rica and the Galapagos Islands, Ecuador. In an effort to protect sharks, Stewart teams up with renegade conservationist Paul Watson of the Sea Shepherd Conservation Society. Their unbelievable adventure together starts with a battle between the Sea Shepherd and shark poachers in Guatemala, resulting in pirate boat rammings, gunboat chases, mafia espionage, corrupt court systems and attempted murder charges, forcing them to flee for their lives. Through it all, Stewart discovers these magnificent creatures have gone from predator to prey, and how despite surviving the earth’s history of mass extinctions, they could easily be wiped out within a few years due to human greed. Stewart’s remarkable journey of courage and determination changes from a mission to save the world’s sharks, into a fight for his life, and that of humankind.